In a most surreal episode, Kirk and Co. find themselves as the Clanton Gang at the O.K. Corral. A Wanted poster seemed most appropriate here! Get a load of Kirk’s’ hair’! A fairly good episode for season 3, although I found the end a tad contrived. At least it let Scotty and Chekov into the action. 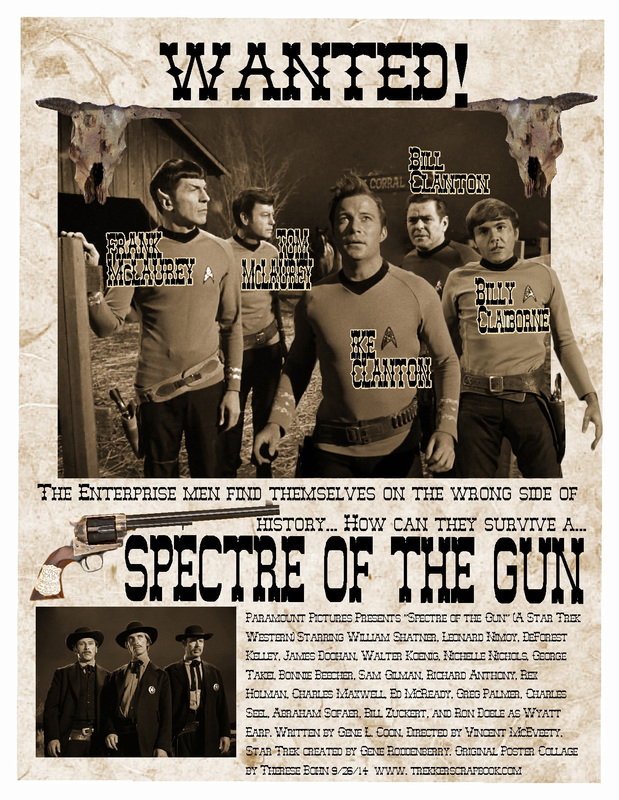 This entry was posted in My Star Trek Posters and tagged Chekov, Doc Holliday, Kirk, mccoy, scotty, Spectre of the GUn, Spock, Star Trek, Wyatt Earp. Bookmark the permalink. But just the fact that Spock willingly had mind melds with three humans shows how the third season was getting off-kilter. Do you recall how in season 1 that when the mind meld was first used it was considered a very private thing to Vulcans? I think the triple mind-meld here was definitely dramatic, but it just didn’t strike me as true to Spock or necessary to the plot. After all, Chekov came back from the dead and I suspect that K,S, McC, and Scott probably would have come back from it as well if the Melkotians were just kidding… However, Spock does save the day in that he knows how to wear a gunbelt! How would one purchase this?